Camping in North Yorkshire – Robin Hood’s Campsite, Slingsby. Robin’s Hood Campsite, Slingsby, isn’t actually in a forest but it is well sheltered and makes a perfect hideaway for the modern Robin Hood looking to go camping in North Yorkshire. Snuggled up next to some pine trees our pitch was a real sun trap. The village of Slingsby is beautiful and sits under the watch of a tumbledown castle which, due to conservation and safety you can only admire from afar. I think this adds to the village’s allure. While we were there the scarecrow festival was on and we spent a wonderful afternoon scarecrow hunting round the village and rummaging for bargains at the carboot. (And scouring the rightmove app on our iphones to see if we could afford to move there, camping in North Yorkshire gave a us a huge taste for Yorkshire life.). Nearby Dalby forest is great for walking and cycling. The visitors centre has a range of trails ranging from a 4km suitable for children’s trailers and tailgaters to extreme mountain biking tracks. The bike hire place even fixed my bike for nothing. 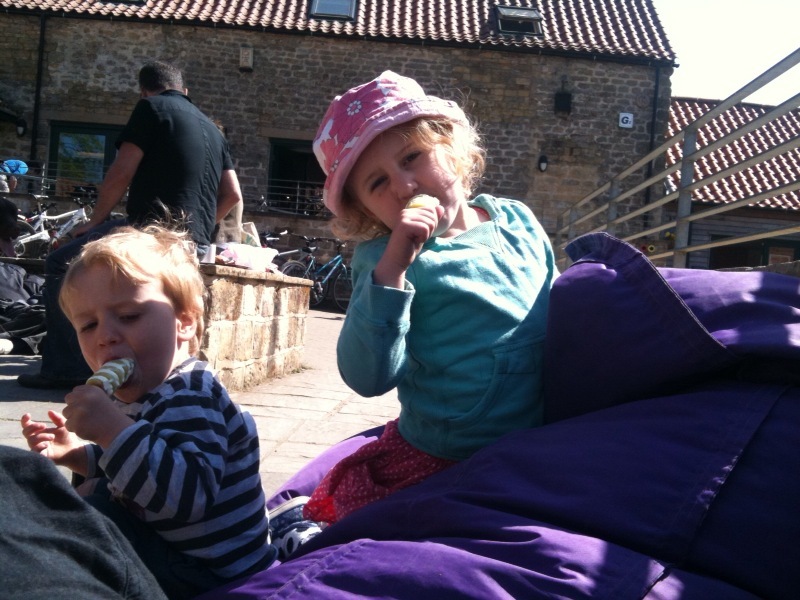 We enjoyed testing out our bikes and trailer and crashing on the giant outdoor beanbags at the cafe with ice lollies. Scarborough is small and compact enough for our 2 and 4 year old to manage a funfair ride, boat spotting in the harbour, arcades, chips, viewing the lifeboat, a play on the beach all well within our three hour free parking on the seafront, and without the pushchair. Howard Castle is beautiful. It was a sunny day so we paid for the garden only, although the owners make it clear that children are warmly welcomed into the house. The 2 yo was very excited about the tractor train ride down to the adventure playground. In a clearing in woodland by the lake, the playground is imaginative with wooden houses and musical equipment. We had a cup of tea from the cafe and enjoyed the sun. We gave the 4yo the map and she took her role very seriously. We found the atlas fountain and the secret garden before stocking up for a BBQ at the farm shop. Robin Hood’s Bay is absolutely beautiful, it is a long winding walk down hill to the sea so we were glad we packed light. There were lots of distractions on the way so we managed, much to our surprise, to get both kids down and up again, without the pushchair or too much fuss. We timed it badly as the tide was coming in and it was a busy Bank Holiday Sunday but it was still worth braving the crowds for a short visit as the 4yo managed to catch a crab in her bucket and the 2yo caught a bear fish. Scampston Hall near Malton was perfect for little ones. The nature trail had them utterly captivated and the 4yo was soon calling out instructions from behind her clipboard and busily crossing off things she had spotted. 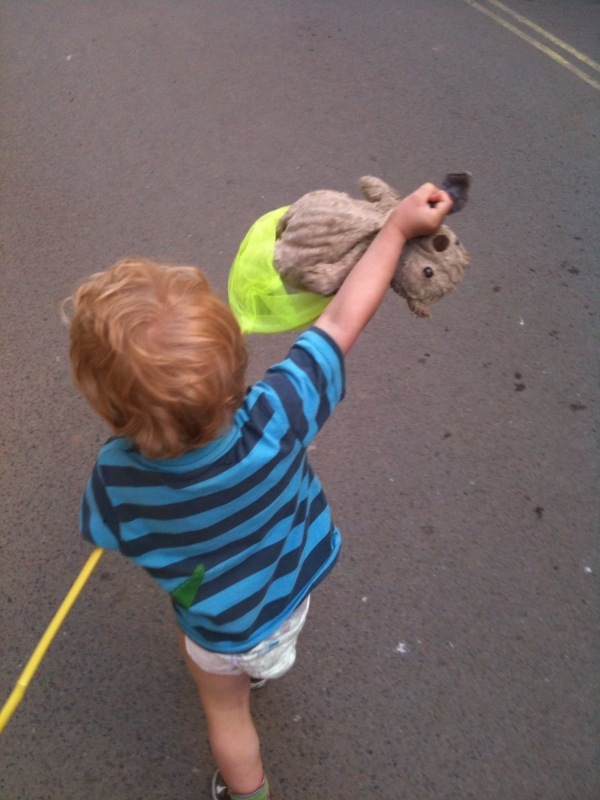 Finding Scamp the Mole’s house was a real highlight. 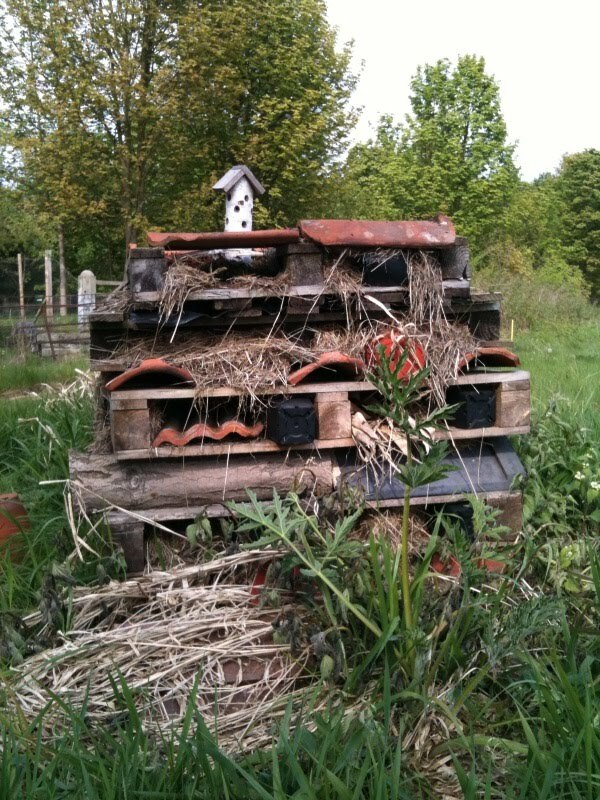 But the insect hotel and the boat also caught their imaginations. The cafe had beautiful food and cakes. While I went to a friend’s Royal Wedding party in another part of Yorkshire, my husband took the children to Playdale Farm Park near Scarborough. There was lots to keep them occupied inside and out. We forgot the pushchair so didn’t brave York. A friend suggested using a caravan site just out of York, near to a park and ride which sounded like a great way to explore York which has loads of child friendly museums. We also ran out of time to do the North Yorkshire Moors Railway where Goathland Station became Harry Potter’s Hogwarts station. We would fully explore Whitby. We would do the coastal cycle path. The children’s playground is very new and has swings, springy animals and a large climbing structure. Tent camping is next to the playground, caravans are further away. Toilets, showers and wash cubicles were always clean, and hot water plentiful even over a bank holiday. Shop sells snacks, papers, odds and ends and alcohol. A fish and chip van visited while we were there. Owners are helpful and friendly. A clean, roomy and well sheltered site, a great base, really well situated for moors, forest, city and sea. >Oo, this sounds nice, and that area is on my hit list. Me and CJ have braved camping now so the world is our, slightly chilly, oyster.